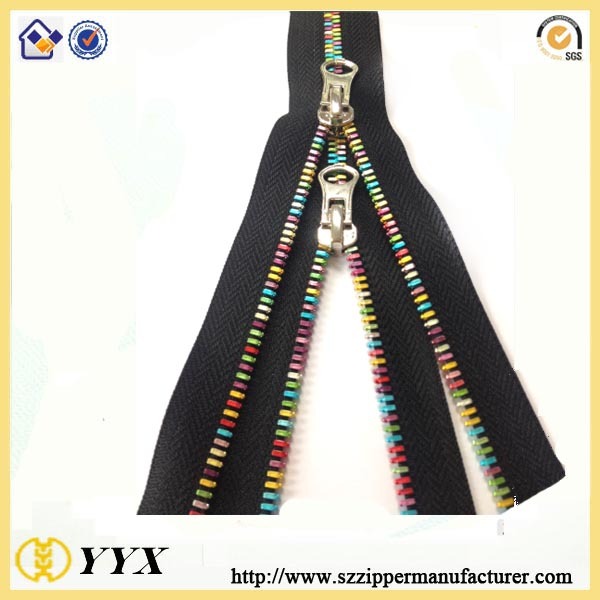 Product categories of Rainbow Zipper, we are specialized manufacturers from China, Rainbow Zipper, Rainbow Teeth Zipper suppliers/factory, wholesale high-quality products of Colourful Rainbow Zipper R & D and manufacturing, we have the perfect after-sales service and technical support. Look forward to your cooperation! 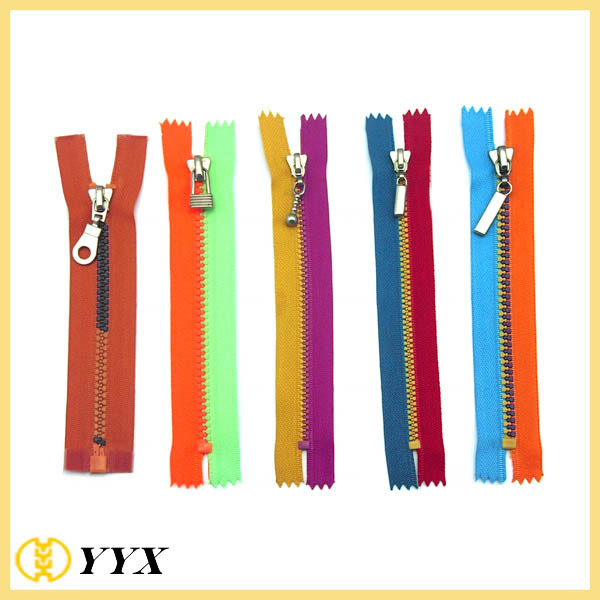 Rainbow Zipper(colorful zipper), a Special Zipper branch, doesn't like other zipper classification, this zipper can be any of the Nylon Zipper, Metal Zipper or Plastic Zipper. What the different from other normal zippers is the teeth color or tape color. Rainbow zipper can be multi-colors with all colors combination. This zipper is rich and colorful, so it satisfied someone who love their clothes or handbags to be colorful and good looking. 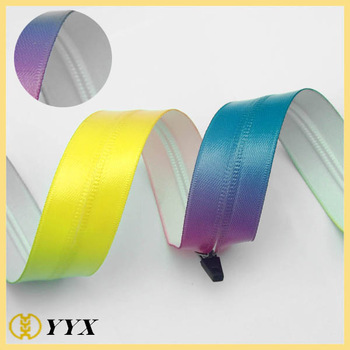 The price of rainbow zipper will be higher than single color zipper, at the same time, the minimum order quantity can also be large than normal zippers. Material: Polyester Tape + nylon, brass and delrin for choice. 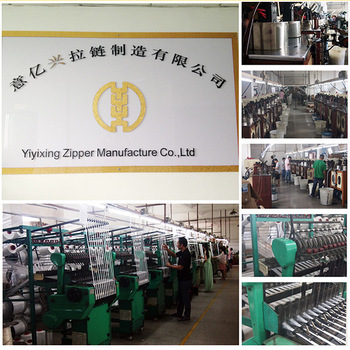 Shenzhen YYX Zipper Manufacture Co., Ltd was founded in 1990. Based on years' experience in zipper production, our zipper are highly appraised by customer in the feilds of garment processing, handbag and tent production. We also produce Lanyard, and Metal Hardware Accessories. We enjoy the advanced and professional production equipment, professional testing apparatus and high quality employees for producions. The products are at high and stable quality. We provided on-time delivery and active innovation as the tenet, we strive for more excellence and stable development. We take the whole world in view and look forward the future. Our tenet: first quality, customer upper most, on-time delivery, considerate service! Our philosophy: humanity-oriented, innovative, enterprising, practical, excellent! Our Direction: Professional, larege-scale, international! 1. Q: Are you a manufacturer? Do you have factory audit? A: Yes, we have our own factory in Shenzhen. 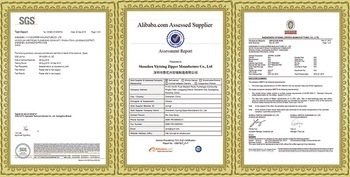 And we have Alibaba.com Assessment Supplier Report(No. : 7302706_P+T) issued by TüV Rheinland. 2. Q: What's your best price? And what is payment method you can accept? A: We will quote you best price according to your quantity, so when you make an inquiry, please let us know the quantity you want. We can accept payment via T/T, PayPal, Western Union. 3. Q: What's your MOQ? Can I mix styles and colors? A: For keys lanyard, MOQ is 1000 pcs per color. Usually we don't accept mix styles, but as your first order, and in view of your sincerity to cooperate, we will try to accept 500pcs per color, but the unit price will be higher than the unit price of 1000 pcs. 4. Q: Can we customize color and size and tape with our own logo? A: Yes, customized color and size are ok, and we can make your logo and design on the product, but usually the mold cost needed for small orders. 5. Q: What is your sample policy? A: We can provide free samples for your checking, but shipping cost prepaid by the buyer. 6. Q: What's your packing? A: Our usual packing for zipper is OPP bag, then packed in export carton. 7. Q: What's the delivery time? A: Usually the production time is 7-15 workdays after order confirmation and deposit payment. 8. Q: What is your shipping method? A: For small orders, we suggest you to ship the goods via door to door express delivery, like DHL, UPS, FedEx and TNT. For big quantity, sea shipment or air shipment is up to you, and if you do not have an agent, we can provide logistic service to you. 9. Q: What is your warranty? A: We are very confident in our products. Every piece of beer holder lanyard is checked before packing, and we pack them very well, so usually you will receive your order in good condition. But to avoid any subsequent trouble regarding quality issue, we suggest that you check the beer holder lanyard once you receive them, and let us know the details if there is any damaged one, so that we can deal with it accordingly. 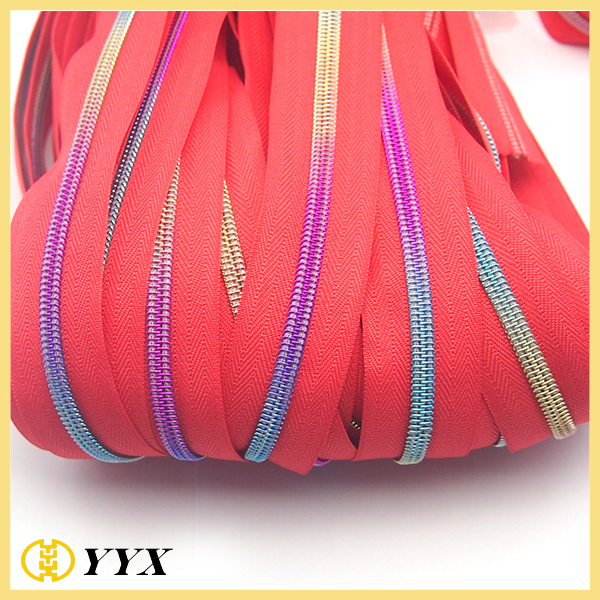 Copyright © 2019 Shenzhen Yiyixing Zipper Manufacture Co.,Ltd All rights reserved.